If you want to build your own tiny house on wheels it’s difficult to finance it through normal channels, so most people save their money and build when they have enough. This is really the right way to build a house and avoid a mortgage. But some people need housing sooner. In the past few weeks I’ve fielded over a hundred emails from people who were recently introduced to tiny houses by the Jay Shafer video on Yahoo. Among the questions I heard a few sad stories of people searching for solutions fast. So I started noodling over an old idea, finding a way to finance tiny houses. You see if a professional tiny house builder could find a way to construct a tiny house that traditional lenders would finance, more people could move into tiny houses faster. I think the answer is to build houses to standards that lenders and insurance companies already understand, which may actually not be that hard to do. Luckily we already have two categories of RVs that lenders and insurance companies understand, travel trailers and park model RVs. Travel Trailer – Towable tiny houses must conform to the trailer size limits required by law, which is typically in the neighborhood of 13 1/2-feet tall, 8 1/2-feet wide, and 40-feet long. Park Model RV – Transportable tiny houses can be physically wider since they are rarely moved and conform to manufactured home standards. These are better if you want more interior space but you give up mobility and will be subject to more building codes when you go to install it on a piece of land. Below is a simple drawing of four hypothetical designs that illustrate how the different sizes compare. The three on the left are RV Trailer size and the one on the right is Park Model RV size. The floor plans are just for illustration purposes. Click the image to see a more legible version. So now I have ten questions for you. Feel free to answer only those you feel comfortable answering. My goal is to figure out what people really want and need. Sorry, there are no polls available at the moment. Sorry, there are no polls available at the moment. Sorry, there are no polls available at the moment. Sorry, there are no polls available at the moment. Sorry, there are no polls available at the moment. Sorry, there are no polls available at the moment. Sorry, there are no polls available at the moment. Sorry, there are no polls available at the moment. Sorry, there are no polls available at the moment. Sorry, there are no polls available at the moment. This entry was posted in Announcement and tagged size, Survey, tiny house. Nice survey Michael. Interesting to see the results. I think you are right, if professional builders could build tiny houses to code, that would be a big help. The other part, as you mentioned many times before, is the zoning requirements. If people could places a tiny house on a city lot instead of a larger house, we would see many more of them. “If people could places a tiny house on a city lot instead of a larger house, we would see many more of them.” Yes! to that. Consider a typical city lot with a cluster of three or four (or more;-) microhouses. This would enable a group of close friends to build a “micro neighborhood” where each person or family had the privacy and lifestyle-autonomy of their own home, but they shared the “neighborhood” common space between their homes. For community, and even basic safety, that would be superb. The common area would provide for socializing and it would be a safe play area for children. The neighbors could keep an eye on each others’ kids, solving one of the major issues for working parents. The same casual looking out for each other would strongly deter burglars and suchlike, and would enable support of older members. The constant opportunities for gatherings among the members and their other friends and extended family, would strengthen face-to-face social ties and happiness for all concerned. 1) That these designs can fulfill all of the essentials of fire and health codes (technical design issues). 2) That the “micro neighborhoods” won’t become problems of one sort or another (cultural prejudice issues). 3) That the properties on which “micro neighborhoods” are permitted, will sustain the local property tax base. The latter may seem like a bit of a “downer,” but taxes are the price tag for civilization: if we want good city government including good schools, sanitation, parks, libraries, services for the poor, and the like, we have to pay for them. This becomes more “interesting” in the context that some folks involved with micro-neighborhoods may prefer to set them up as land trusts or in some other manner that does not become subject to real estate speculation and unaffordability. Meeting both sets of goals: adequate taxation without property price escalation; will call for serious thought, and possibly for special contracts with city government, and/or appropriate changes to municipal codes. I’m inclined to think that one of the critical technical issues for micro-neighborhoods in cities, will be water & sewer connectivity. This in turn may lead to the requirement, especially in climates with freezing temperatures, for full basement foundations. OK, no problem: overall costs for microhouses would still be substantially below the costs of larger houses. Electricity and telecoms would be wired in the normal manner, plus or minus solar power where possible. Parking space might be an issue, though it’s likely that people building micro-neighborhoods will tend to share vehicles or have fewer automobiles than usual. If anyone here knows of any sort of “micro neighborhoods” that are being built on standard city building lots, or has any other ideas to contribute, please post replies with links. the issue of taxes could be meet by having the block valued at the total value of all units it could be said that the units would be equal to studio apartments on the lot. this should make the city offices happy cause if the units total value is more then the surrounding homes this would increase the neighbor hood real estate values. As far as the lots make the utilities be installed on set foundations and have it wide enough to accommodate a standard tiny house with enough room for a standard car and a 10 foot easement between the foundations. This if done correctly should give you slabs 42′ x 8’6″ for House and 3′ between house and car 6’5″ for car and another 3′ for passenger walkway for a total of 42′ long x 12”6″. This gives you your house space, car space and sitting and recreational space in front of the car. Well just a though or just put it just outside city limits as most cities don’t allow trailer or RV parks inside. An easy way is to get a college campus to start a small Tiny House community as part of their structural classes. Financing would be great, with a 5-10 yr mortgage, then I could buy exactly what I wanted and not have to settle. Even better would be being able to park it on any land whatsoever. I don’t know anyone with a big enough yard to park it in. But… where to put it? There are just to many laws around here. Any time you try do anything innovative, every time you turn around, there is some stupid, law people didn’t bother to think through, and some inconsiderate asshats bent on brainlessly enforcing it. People just don’t *think* enough. And where will you put this tiny house, once you have it? 2. Since a trailer based tiny house is technically a tiny house you can typlically live in one anywhere it’s legal to ‘camp’ on your own land. 3. Look for multi-family zoned land anywhere. Typically there are no unit size minimums for multi-family zoned property so a loophole may be open here. 4. Many trailer parks. But also consider buying an existing trailer park or campground with friends and turn it into an ecovillage. 5. Many rural areas, even outside major metropolitan areas will be more flexible with set-ups like this. 6. A friends backyard. ‘Camping’ may be allowed in some areas but also look into ADUs (accessory dwelling units) possibilities. Even here in rule-ridden California we have laws that permit these as in-law units. All interesting, though its bothering me to great extremes that this entire country seems to be hung up on sq footage requirements, as if that has anything to do with cleanliness…has anyone seen Hoarders? (that cable show) awful… everything Ive seen even camps are well taken care of, the size lends it. I was at a municipal meeting in my old home town where zoning increased from 1500 to 1800 sq ft for new builds whose working where? there isn’t any small, safe job, I know that can pull that mortgage lately..i’d rather find my way out of a sinking ship while I still can, and live happy for the kids before we loose everything all together. Rather choose, than loose. My energetic opinion is that which is reinforced by the constitution I served for, Its insane to pose restriction on what can be called someone’s home for nearly any reason>>>Protect and preserve the land and rights our forefathers handed down to us…through exercising freedom of speech and right to assemble. DING! sq ft minimums are a joke, and it’s hilarious when your not the buyer. I am very interested in the results of these questions as a craftsman and considering building these houses. The results would be very useful in determining options to include and models upon which to focus. Very good job. Thank you. One other question you might add in whether or not they want a shower or a shower/tub combo. For me this is essential. Thanks Rhonda! Forgot to add that. people pay tens of thousands of dollars for itty bitty apartments in big cities and in European countries and think it’s great. these are houses! i love them but i have lived in travel trailers off and on for months and years at a time. you really learn to travel light and not waste space. i especially like the furniture that people have designed to use in small places. and if someone couldn’t see living in a couple of hundred feet-build pods. living in one and bedrooms in another. great websites though-i spend hours checking out these places. Good post! And the financing issue is a major one in the tiny house movement. While many adore the tiny houses, they either don’t have the carpentry ability and time to build one or the $15-40K to buy one complete. What we decided to focus on in our business is the minimal small house that meets all building & zoning codes. We primarily build a 640 sqft cottage- 400sf down/ 240sf up that meets all codes and qualifies for all regular mortgages. By specializing in this, we can easily build a complete turnkey house with foundation and all in the mid $50’s. Thanks Barry! Your little cottages look great too. Thanks! I think it would be great to have a finance option and a basic shell. The basic shell would only be an advantage if you can get all the “code” stuff done by a builder as well as save money. Paying more for the novelty of doing some of it myself is NOT acceptable. Code restrictions and financing are the biggest hurdles,IMHO. As for the questions, I found it hard to choose as I would like a trailerable tiny house for the short term but would like to build a bigger(~400sqf with ~150sqft of unfinished attic) permanent structure after I get some money and settled down. I find that in my 700sq foot apt, my bathroom and kitchen are way too big and I really don’t need such large living room. The bedroom could be cut in half and I’d be just as happy in it. My main design feature I’d want with a tiny house is a bed on the ground floor, since aging can make it difficult to go up and down a ladder – my plan is to have a tiny house as my primary residence after retirement (in 5-10 years). I am seriously thinking about this type of housing so I can live cheaper/leaner, work less at my job & enjoy the life I have left. Climbing up a ladder to sleep or safely navigating down for some urgent call of nature is not so appealing. I figure I have to wait until my sophmore child graduates (or convince her now) before making the move. But that does give me time to plan & save up. I think it would be awesome to forget the banks and put together a peer to peer lending program for tiny houses. That way, the two people could get together and discuss the terms of the loan and proceed from there. We would be helping eachother out and pretty much telling the banks to eat s*** and die. I dig it! Great post as usual. Keep it up! Hey Lelly that’s an interesting idea. I wonder if people would finance a tiny house over at prosper.com. I bet they would. That would be a great place to start. This idea is in perfect harmony with the concept of the tiny house, jumping off the grid. I love it. Would love to see a version with a side entry instead of an end front door. By having a ‘room’ or room area at either end, and entering thru the side, you lessen the need for those space hogging hallways. Side entry doors are a great idea. And I envision them as being a way to expand the amount of living area too. For example, park beside a carport, or something and use it as your utility area or workshop, have a porch off the opposite side. Or park 2 trailers beside each other, and one is your kitchen and living room, the other your bed and bath. Or maybe one has your room and the other your kids room? As for the larger problems with tiny houses, it needs to have at least enough amenities that you can actually move right in and live in it. To me that means at least a toilet, shower plenty of electrical outlets and an air conditioner. In Houston a place can’t be considered livable without an air conditioner, I don’t care how green you are, but heating on the other hand might be optional. Yeah, you might have a few uncomfortable weeks in December and January without heat, but you’ll live. Refridgeration for food storage, and a stove top are also considerations, but less important. A crock pot can cook a lot if you have a plug. But eventually we’re going to be looking for a hot plate too, a hood with a fan when we try to fry bacon, and a toaster oven. We’ll probably need a fridge sooner than that, but it isn’t something we should have to be married too. Though actually, I think having a stove for cooking is very important, and I wonder why people who are into efficient living wouldn’t think of driving the heating and cooking functions from the same power source. Isn’t that how it used to be? Maybe its time to return to that. Couple of things… This is essential, the money aspect I mean. If you don’t have a chunk of change from equity or whatever you have only two options maybe three. Build out of pocket as you go, Get all the materials you can from scrap, surplus. or borrow from your rich aunt. I can’t see banks ever taking on this kind of loan. Maybe some sort of alternative to traditional lending could work. Even ten grand is a stretch for those who’ve lost jobs or fallen on hard times. I’ve designed lots of custom homes over the years and I could spend as much time on one of these as I did for something ten times the size. To make everything count in a small space you really need to rethink everything. Daily routines, down to the brushing of your teeth. One thing to remember is sense of space. If you fill everything to the brim you might find there is no breathing space. Use windows, lighting, orientation and color to expand the sense of distance. Also use outdoor rooms, IE porches etc to expand the space. The issue for us is always the land. Land itself is so expensive. I could live in a small house IF we had the privacy of a secluded yard/lot. It’s very hard to find a nice piece of property we can afford, PLUS a home. We just refinanced our mortgage, but I am middle aged and don’t want to work a job I don’t love to keep this house…which is far from my dream home. I want a home that is paid off ASAP! It would have been interesting to know the age range of the respondents. I am nearing 50 and a tiny house is the next step in the downsizing from the already downsized house I currently live in (about 1100 sf). As a result of downsizing, I am mortgage free and don’t wish to have another mortgage ever again. Though I doubt commercial banks might be interested in this sort of real estate (for now) as long as they continue to pull in billions in profit from trading bits of paper amongst themselves. Besides this poll providing insight into what people might want in a tiny house, there may be other entreprisers amongst us who see this as an opportunity to re-introduce true small, scale banking (micro finance banks)- you know the kind that is willing to loan even small amounts money, secured by real assets and deposits, at a reasonable rate, for a reasonable profit, who know their customers and stick with you for the duration. I believe there are already some in the US. Maybe it’s time to take back the banking system, not just the housing system. I would love to see people supporting other people. We’re stronger together after all. I think this kind of mortgage is a bit different due to scale. It could be more like an auto loan than a home loan in scale so much more easily paid off… much like the loans for homes back in the early 1970s. As far as lenders at any size, determining risk is mostly what they are interested in. the lower the risk and wider the margin the more likely anyone (big bank or micro-loan investor) would be willing to lend the money. This is why I think the trick it to use pre-existing standards the main-stream companies would accept. Even if a big lender is not chosen by the borrower the risk can be better defined. Thanks for doing the survey, as data is a really important tool to use in marketing and projecting out how to develop/grow a business, and I love data. This survey has a lot of useful data in it for a builder of Tiny Houses and also the DYI person. Marci, The challenge with having a side entry is location the wall space for entry can become a challenge when placed on a trailer. We have designed a cabin for side entry, and that enters in through the bathroom area, so the bath area serves also as a small airlock and is readily accessible from outside. That cabin is also built a non toxic model. Building to code for an RV/Park model is fraught with problems. And while you can often get an RV financed through the company/dealer, park models are a different story. We found an incredible 400 sq ft “showhome”, built with *all* the options the builder offered. $40,000 less than lot price. Mortgage approved until the financier asked about power supply. At that point the deal fell through, because PMs are wired for 50 amps and no mortgage co. will take on anything less than 100 amp power. Nobody would touch it. The company has quit making PM’s because no one will finance them. 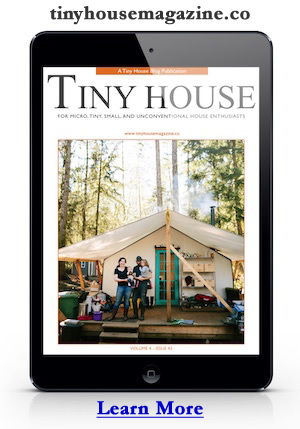 I wonder if there’s potential for a Tiny House co-op micro-loan company? With as many people as are interested it might be possible to raise enough capital to finance a few places – maybe a five year payout? Just a thought, but you might get some energy-conservation organizations to kick in start-up funding or grants. I wonder what the challenges are to take it from 50 amps to 100… Is it a huge cost difference to just meet the criteria when building? Hi Alex. I don’t think there is a huge difference in cost between a 50 and 100 amp service. The cost difference is minimal maybe a $100 more for it. The challenge is that RV sites do not have hookups for 220 service, and most of ones friends would not either. A benefit is that 100AMP allows for just in time water heaters, plus more conventional items. Everything in the RV stores costs considerably more than the box stores standard items. Building codes and land use have kept a lot of people who were willing, if nothing else, to try smaller. Here, they require a minimum of 800 square feet. Matters not if they finance or not if no one will allow them by code. The park model industry did have the rug pulled-out from under it, not sure why exactly. Seems like a great size home, and in all the surveys I’ve done is the right size most people reporting to want. Minimum square footage for residential is a challenge. One work around, if you don’t want to work on changing the rules, is to find a lot zoned multi-family. Typically these are lots where an apartment building or trailer park is allowed. There are usually no minimum size defined for these kinds of zones, but check your local codes first. Except for roughing it, and the last question, I was with the masses. I live in Texas, so I need me some AC of some sort. Some demographic questions re: age, gender, etc. would be a good idea. I am deeply impressed would by your outlook and designs, is there a simple way to look at all your designs? I am totally focused on this now, want my forever home that I feel good about and can afford. Thanks for all your and those in the movement’s efforts! A shell option is very attractive to me, seems like that would be the most difficult for many and the interior could be done any time, any weather. I also found some ideas for a community somewhere and I’d been thinking about that. A sense of self worth and pride of ownership could be more easily maintained. Energy efficient to completely off the grid is attractive in more than one way. There is a microwave/convection oven that would be nice in a small space. Also, recommend the cookbook The Pleasures of Cooking for One. Size of refrigeration might be related to the access to food source. I’m not so good at google sketch up, but I’ve some ideas I’d like to draw…couldn’t you have some sliding windows that form bays when parked that would give more a sense of interior space, something like what you did with the ‘market’ house? Interesting survey Michael. I am really glad that you included the results as well because I have been curious for a while what people think about tiny houses. I already have a stationary 12×20 “cabin”; I want one that I can use to go on trips, camp out in friends/relatives yards – even some campgrounds. My dream house has got to be one level(no loft for me, as I am getting arthritis and I can forsee problems down the road), and a ramp. I’d love an all-around porch(part of it enclosed, so I can put my paints and art equipment there, plus a chair/rocking chair to look out at the world). I would like one bedroom, bath with shower(no tub–I’d have dfficulties getting in and out) and toilet..perhaps a bidet? I would like a good kitchen with storage fitted for a short person(I am 4’11” tall). and a pantry area. I would probably build an outside pantry to hold items that could be stored outside–canned goods and the like. I would like a dining area/living room/library combination–I have a lot of books, and a place where I could store a CD player and my CDs. The living area would have a couch that could serve as a guest bed should I need it, perhaps with storage underneath it as well. That’s basically it. I don’t need a lot of land–just enough for a small garden–no lawn, except for a few flowers and maybe a small tree or two. There would be a bench outside for sitting, a water feature for the birds, and perhaps an outdoor fireplace for barbecuing/socializing. I would like solar power, and be off the electricity grid as much as I could. Perhaps a combination wind/solar would work. Are there any resources for someone who is disabled and has little in the way of money? I would like to know! I have been designing Timber Frame homes for many years and have been working on a line of Modern Post and Beam homes that range from 600 to 1500 square feet. We have worked with energy efficient building products (combined with solar building and design methods) for over 14 years. At this time I am working out the details for providing in-house financing for the design, construction and delivery of custom tiny homes. Any ideas, advice, or partnership offers will be happily considered. I find all of this interesting and exciting, but I am nervous about where I am trying to build. If I must, I can save up the money to buy part of this house, but as I am interested in either designing my own Shipping Container home, (not portable) or purchasing a decked out FENCL, I am assured that I will be needing some kind of financing. I have the VA Loan, but I was told they would finance the land, but not the house. If I owned the land, they would finance the house. I gotta love this, as I live in Santa Monica. I am up for the mountains or valleyscape for land, but if you know the area, well, lands just not cheap. However, I have to admit, purchasing a $500,000 spot of land overlooking the ocean and Malibu sounds amazing, and I am sure it would increase in value over the years. Could you imagine walking out to that view every morning, knowing you already own the house, even if you don’t own the land? Wow. But I have recently founds spots in Topanga for $30,000. That’s amazing for the mountains above West LA. As I said, I am just trying to learn how to do all of this . While I would love to architecturally design and then have someone approve my plans, I am thinking out here, a FENCL would be a cheaper route to go, and I am already drawing out the details. I just need some help trying to figure out how to get this thing going…because as the posts prove, the govt and banks are against tiny homes. Noble goals… but it is the people in the most need of something like this that would be unable to get financing. My son and I are physically handicapped and wheelchairs may be in both our futures. With the increase in general population of older folks, have you considered handicapped accessibility in your plans so folks could age in place? I liked the plans with the 2 bedrooms on the lower floor, that would work, but the doorways might be too small. What can you suggest? We currently live in a 3 bedroom trailer and can get around well, but there may come a time when we’ll have to move. With my husband’s job, we move frequently and I already homeschool our children–mainly for this reason. How feasible is something like this for a family? Love your comments policy, btw. Thanks for trying to keep it classy!